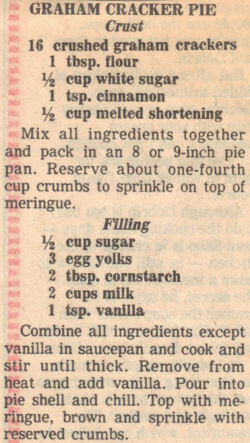 This recipe was clipped from a newspaper and found in a large collection, marked date is 1985. An intro to the recipe mentions that years ago this was printed on the side of Nabisco graham cracker boxes. Mix all ingredients together and pack in an 8 or 9-inch pie pan. Reserve about one-fourth cup crumbs to sprinkle on top of meringue. Combine all ingredients except vanilla in saucepan and cook and stir until thick. Remove from heat and add vanilla. Pour into pie shell and chill. Top with meringue, brown and sprinkle with reserved crumbs. Thank you for sharing this recipe, my mother use to make this pie and brings back fond memories. Thank you for this recipe! I used to make it myself, and loved it! I have been searching for this recipe for years! It was the first recipe I found on my own and prepared on my own when I was about 13 years old. Thank you!!! My Mom made this pie hundreds of times from h 1950’s. It was a treasured dessert. She had the recipe cut from the side of the Nabisco box. I still make it. Posted on this earlier. Original had NO cinnamon but it is a nice addition.